Illicit wildlife trafficking is driving some of the world’s most iconic animals and plants towards extinction, as well as some species you may never have heard of. It is also threatening our own personal well-being, the livelihoods of local communities living amongst wildlife and, in some cases, even national economies and security. Fortunately, the international community has woken up to these serious threats and today there is a global collective effort underway to end wildlife trafficking, as can be seen in the resolutions adopted by CITES (in 2013), the UN Environment Assembly (in 2014), and the UN General Assembly (in 2015). Today, across every continent, governments, organizations and citizens are tackling both demand and supply, looking out for contraband in transit, and working to support local communities – which is making wildlife crime much riskier and far less profitable. As a result, while the overall levels of poaching and smuggling remain far too high, we are seeing improvements in a number of countries and with some wildlife populations, including in Angola – the generous host country for World Environment Day this year. While we are clearly not there yet, we are beginning to turn the tide on wildlife trafficking – and the days of wildlife crime being high profit and low risk are over, as countries increasingly heed the call from the UN and CITES to treat wildlife crimes as serious crimes. Yet, success, very often, comes down to the actions of committed individuals. That is why this year on World Wildlife Day we rallied around the theme “the future of wildlife is in our hands” and now, on World Environment Day, which is themed around illegal wildlife trade, we call upon everyone – no matter who you are or where you are – to commit to taking action to secure a sustainable future for wild animals and plants, as well as for ourselves. World Wildlife Day and World Environment Day have helped set the stage for the World Wildlife Conference – or CITES CoP 17. In September of this year, the global community will come together in Johannesburg, South Africa to decide on the rules that govern wildlife trade – both to regulate legal trade and tackle illicit trade: at what is shaping up to be one of the most critical meetings in the 43-year history of the Convention. 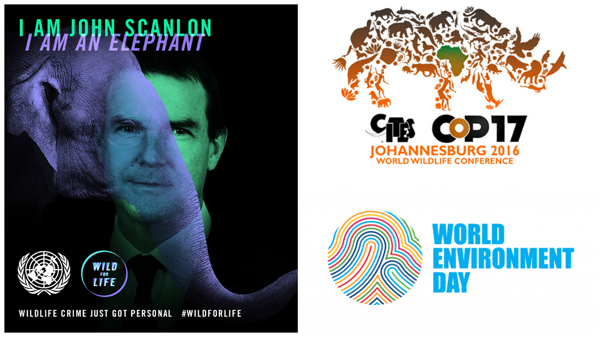 Join with us in celebrating World Environment Day on 5th June – Let’s Go Wild for Life!